Our Component Video/Digital Audio Balun allows one component video (YPbPr or RGB) signal and one Digital Audio signal to be transmitted via one Category 5 Shielded twisted pair cable for more cost-efficient cabling. 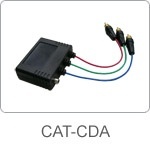 Used in pairs, the Component Video/Digital Audio Balun supports 480i/p, 720p and 1080i/p video formats for hi-definition video applications. Component Video (YPbPr), RGB Video (sync on green) 480i/p, 720p, 1080i/p. Humidity : up to 95% non-cond.